While most people would be aquainted with Machu Picchu, less would be familiar with Huayna Picchu (also known as Wayna Picchu). But Huayna Picchu will, quite literally, bestow a different view of Machu Picchu to you! Huayna Picchu is the mountain peak that towers over The Lost City of the Incas. It is that tallest peak as seen in the many iconic pictures of Machu Picchu (the big "nose" of the face, if you know what I mean). 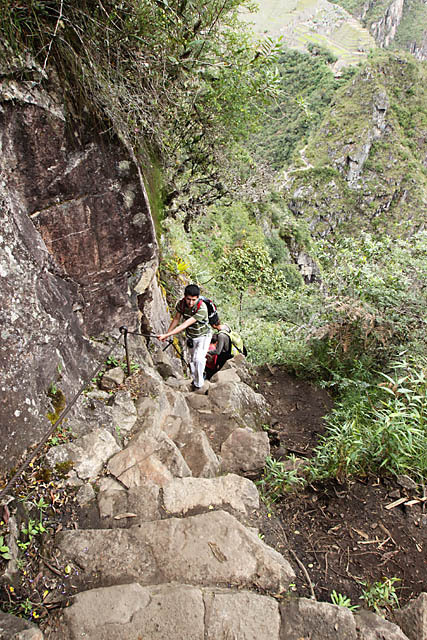 Access to Huayna Picchu is restricted to only 400 visitors per day, split into 2 batches of 200 each, on a first-come-first-serve basis. The climb up is narrow and steep, so I guess this is a good arrangement. So together with other visitors who wanted to climb Huayna Picchu and were afraid that we could not get within the allowed number, we were at the gates at the base of Machu Picchu way before it opened. The moment the gates opened (5.30am) it was a mad race up to the Machu Picchu entry gate (where the Huayna Picchu "ticket" is issued). 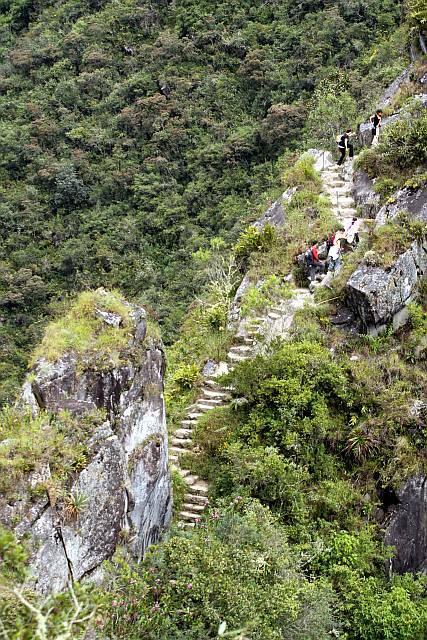 This is to ensure that we would be there before the first bus from Aguas Calientes reaches! But apparently, from what I gather, advance reservation is possible together with the purchase of your Machu Picchu ticket! Anyway, it was an exhilirating (albeit tough) early morning exercise! After the strenous climb just to get the Huayna Picchu entry ticket, the climb up Huayna Picchu itself can be done at your own pace of course. Not a walk in the park but definitely manageable. At the peak, you can also visit some caves and temples but the views are what I climb for! 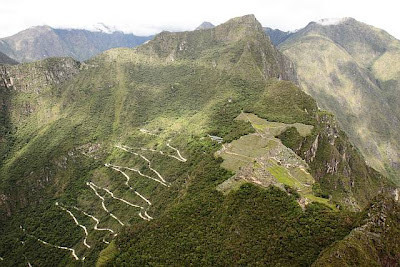 From the summit, you can see the entire Machu Picchu in its full glory (as well as the the zigzag road up from Aguas Calientes). 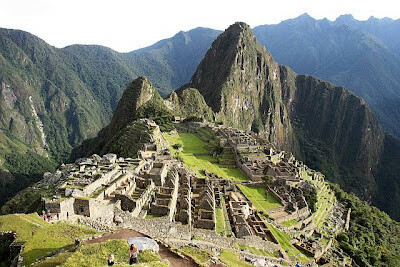 The Incas built the city in the shape of the condor, and one could only see it from a high enough vantage point! Can you see it? Also, supposedly, old Cusco was built in the shape of a puma, and Ollymtambo was built in the shape of a llama! I was at a high vantage point in Ollymtambo but could not quite make out the shape. I supposed these towns/cities are expanding living sites, so the old shape may not be there anymore. Or maybe, you would need an almost aerial view to see it. 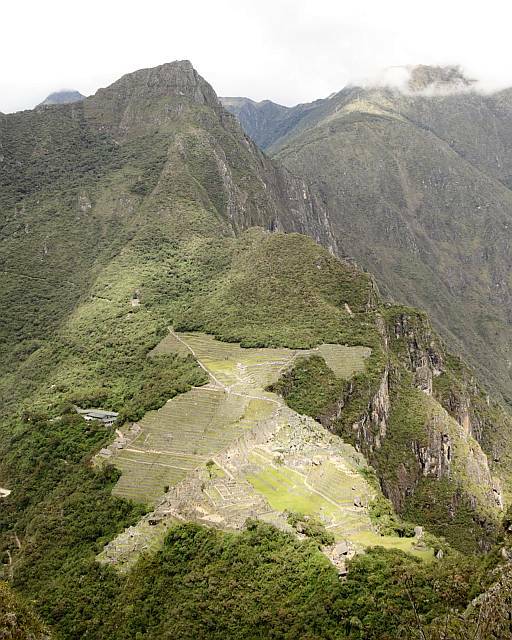 But make the effort, and from Huayna Picchu, you could still make out the condor that is Machu Picchu! Thank you for sharing this. It looks amazing. I wish I could go, but my trip to Perú this time will be centered on Lima. Thanks, glad you dropped by.